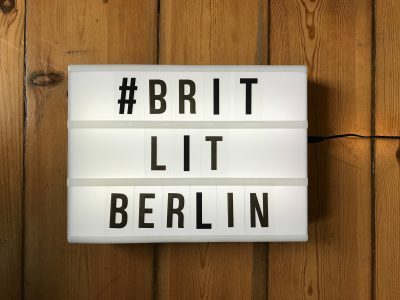 Our guest authors Sonya Permiakova attended this year’s #BritLitBerlin conference about “Cities in Contemporary UK Literature” and shares some of her impressions with us. The programme of this year’s British Culture Literature Seminar was brought together by award-winning poet Michael Symmons Roberts – and it was due to his effort that this January weekend was very much poetry-driven, which was very refreshing: the novelists clearly dominated the seminar in recent years. Among the invited authors were 2018 Booker-Prize nominee Robin Robertson, novelist Susan Barker, acclaimed writer and critic Olivia Laing, poets Niall Campbell and Liz Berry, and Young Identity Group, a poetry group from Manchester whose performance closed this year’s seminar. The focus of the seminar was the city – both real and imagined, as an inspiration and a constant struggle, as a space of living and writing. It was subversive on the organizers’ part that London was largely absent from the discussion – same as Brexit, or the “B-word”, as it was elegantly euphemized in the opening speech of the seminar. The focus instead shifted to places like Manchester, Leeds, Birmingham – as well as New York, Los Angeles and Beijing. In the opening event of the seminar, Michael Symmons Roberts read from his Mancunia (2017), a beautiful collection about the poet’s own Manchester, both real and fantastical, the city, which like A Mancunian Diorama, the poem he read, consists of myths, stories, “poor victims of Peterloo” and “Tootal textiles where (a personal aside) my parents met” – all bearing the same weight, the same significance for his own private relationship with his town’s history. “Manchester is a storytelling city and I think it always has been. The seminar’s favourite – judging by how quick her books had sold out on this year’s book stand – Liz Berry read from her first collection of poetry, Black Country (2014), which is the name of the area of the West Midlands where she grew up. Her way of preserving the Black Country in writing is through its dialect – which, according to the poet herself, has such an awful reputation in other parts of the UK, but for Berry carries tremendous significance. It is in that vernacular language that she finds “linguistic treasures” which bring her poetry into existence. Berry now lives in Birmingham, and since her first collection came out she gave birth to her second son, the event which inspired her most recent collection, The Republic of Motherhood (2018). In 2018, the title poem of the collection won the Forward Prize for Best Single Poem. Berry talked about how the experience of motherhood changed the way she moves in the space of the city: this is the newly found space that belongs to women with children, the city she wasn’t aware of – “city of people who go out of their homes in the afternoon to buy bananas”, the ironic definition coined during the panel discussions between Liz Berry and Niall Campbell, who also draws from his new parenthood to write his poetry. but I was looking for the grief, joy and metamorphosis I experienced at that time. While women around me were brutally honest about motherhood, literature wasn’t. It was Olivia Laing, the author of the brilliant The Lonely City (2016), who also spoke about the female experience, and experience of anyone seen as “other”, in the city. Laing talked about the awareness a woman has of her body moving through crowded spaces – her body as an obstacle, as making her visible – in opposition to the romantic figure of the traditionally male flâneur, who is at liberty to walk through all of the corners of a city unnoticed, if he wishes to stay that way. Laing also talked about her first work of fiction, Crudo (2018), which was written over the course of seven weeks in 2017 – as she was preparing for her own wedding and making an attempt to record all the political and private events unravelling around that time. She remembered how even on the day of her wedding she had to rush off for a few minutes to take notes, as another member of Trump’s administration suddenly got fired (which, she commented wryly, seemed to be of great significance at the time – now even remembering the name of yet “another member” is a struggle). “In our time, the news is the weather. This intertwining of the personal and the political in the space of the novel – as well as the fact that Olivia Laing’s original intention was to publish the journal she kept over the course of summer 2017 privately, for a limited group of friends – makes the writing reach its most vulnerable point, to such an extent that Olivia Laing had to, quite apologetically, break off her reading after only a few sentences. This was, perhaps, the most powerful and moving moment that had happened on the stage over the course of the seminar. Sonya Permiakova is a PhD student and lecturer at the Centre for British Studies, writing her thesis on British women’s poetry of the First and the Second World Wars. Before joining the Centre, Sonya worked on various cultural projects in Perm, Russia. Her research interests include gender studies, twentieth-century poetry and fiction, and poetry translation.